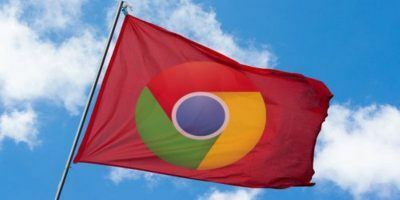 Everyone seems to have loyalty to their favorite browsers. Sometimes the debate becomes as heated as the ever-present Android vs. iPhone debate. 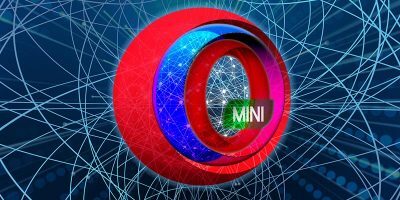 With browsers like Chrome and Firefox out there, some may not realize there are other browsers available — browsers like Opera. The Opera web browsers have never become popular with the public. Their browsers only handle about two percent of all web browsing, though their mobile browser is really good. 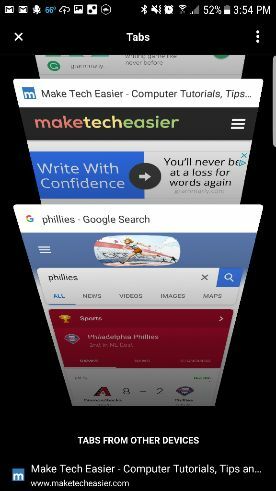 Their new browser, Opera Touch, adds some new features to simplify some basic browsing tasks and might attract your attention. Opera wanted this browser to support the user by making the mobile version easier to use than other browsers. One thing they did is to move the search access and web navigation tools to the bottom of the screen. This position allows you to work seamlessly through many different tasks without repositioning your hands on the phone. 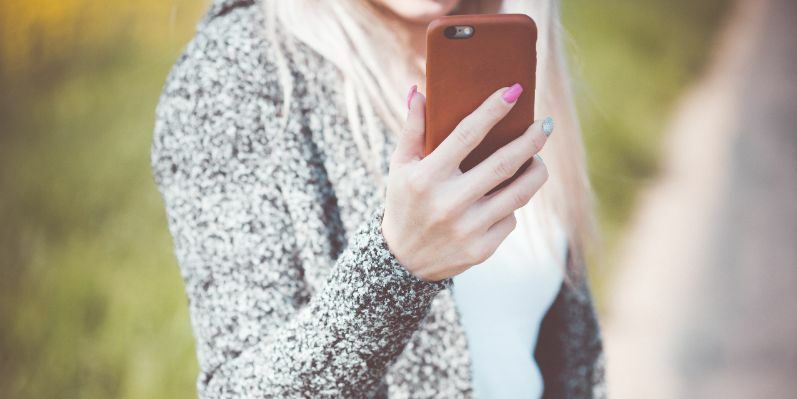 To get the most out of your browsing experience, you need to install Opera Touch on your mobile device and the Opera browser on your computer. 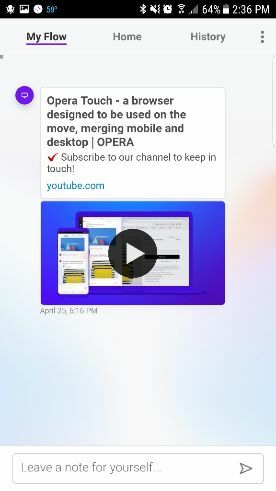 Opera for mobile is available now for Android users, and the iPhone version is coming very soon. The desktop version is compatible with Windows, macOS, and Linux operating systems. 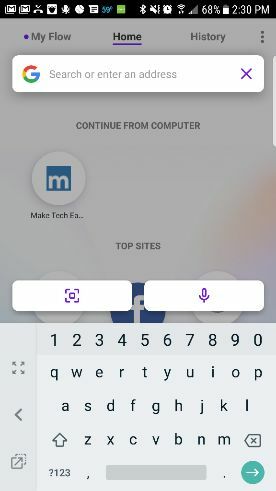 The navigation on Opera Touch mobile is swipe-dependent, utilizing the Fast Action Button (FAB) which enables you to use one hand to navigate your browser tabs at the bottom of the screen by swiping. Scroll down on the mobile browser to reveal the Fast Action Button. Press and hold the button and swipe to switch to other tabs, reload a page, or send the page to Flow (more about Flow later). Tap the FAB button once to return to the search screen. 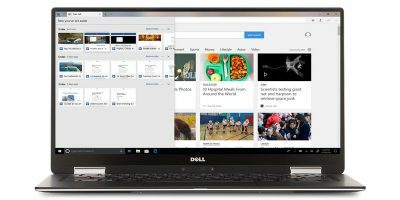 The first thing you want to do after installing Opera to your computer and smartphone is to link them. Linking them is a straightforward process. Open “My Flow” on your computer and click on the Settings gear in the corner. Follow the instructions for connecting the two devices, which only requires you to scan a QR code with your phone. When your link is complete, you are ready to use Flow. 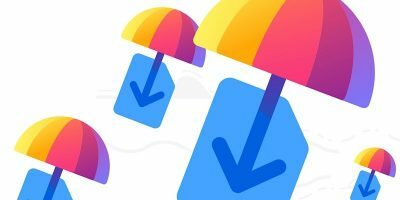 The Flow feature on Opera is helpful for those of you who find something while browsing on your smartphones that you want to send to yourself to view later. 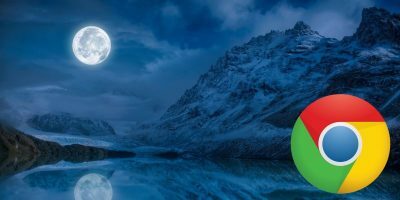 According to Opera, 69% of smartphone users do not use the Sync feature on their browsers because it requires too many steps which include logging in. You never need to log in to Opera Touch because you don’t need an account to use Flow. Sending information to sync on your computer using Opera is a one-step process. To push a site, hold the FAB button and slide to the small triangle to the right of it. The browser instantly sends the site to your computer’s Flow pane, and a notification dot will appear on the sidebar, indicating the action is complete. 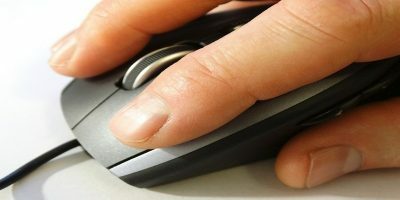 Sending a site to your phone from your computer takes one step as well. Click the arrow in the top right corner of the screen (next to the favorites heart). A notification will be sent to your phone announcing the transfer. Flow is not just for websites; you can also send images, videos, screenshots, and notes to yourself by using this feature. 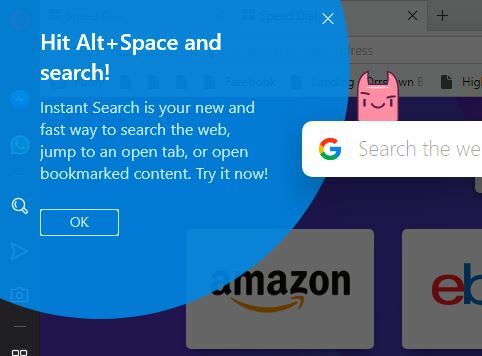 The latest update to the Opera desktop browser also adds a new method for searching by pressing Alt + Space. When you use that shortcut, a search bar resembling a widget on a smartphone shows in front of the browser. When you click on a result, the search box disappears, and a tab opens with the link you clicked on. Doing this eliminates the need to backtrack or open a new tab to search again. 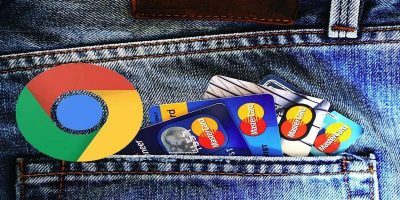 For the security-minded, Opera Touch comes with an ad blocker and a cryptojacking shield. If you want to use those, you’ll need to enable them since they are turned off by default. 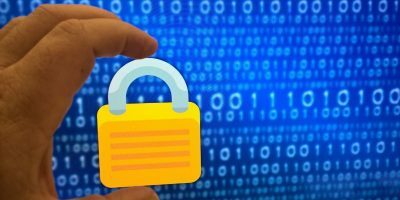 There is also no need to worry about security while using the Flow features because it is end-to-end encrypted. Opera Touch adds new UI capabilities that the more well-known browsers haven’t integrated yet. It probably won’t be enough to push it into competition with the others, but busy mobile users may enjoy these new features. Cant change search engine in Opera touch for android. Therefore Im sticking to my prev engine.